So, part of trying to get better with designing is redoing the layouts of my older patterns. The Come Fly With Me Socks have been available for some time, but I didn't really have good pictures of them. I decided if I was going to update the pattern, then I needed to update the pics too. Enter my wonderful sample knitter, GMarie. I sent her some yarn (Dream in Color Smooshy) and in return she knit me some socks. 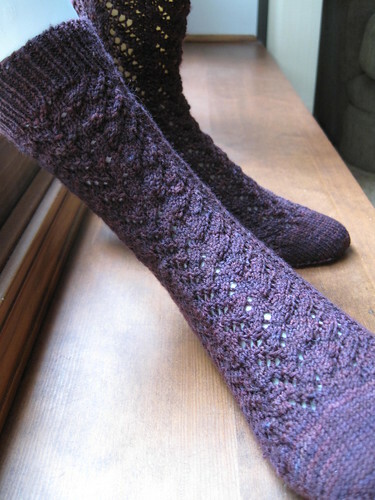 She knit them so quickly and beautifully. Thanks so much, Gaylen! I love my new pics for my pattern. And, I think I like the pattern even more with this yarn. I will need to knit myself a pair soon, I think. 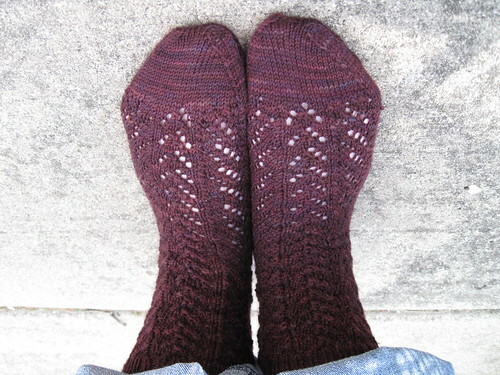 In celebration of the "re-release" of my Come Fly With Me Socks pattern, all my sock patterns in my Ravelry shop will be 20% off now through 4/30. That means each pattern is only $4!!! No coupon code necessary. Discount will be applied at checkout! Thanks again everyone for the support! Happy sock knitting!